Brexit, US presidential elections, demonetization, none of these events—perceived as negative shocks—could keep the domestic equity markets down for a long time. After falling around 1,000 points (or roughly 11%) from a peak of 8950 in September 2016, the benchmark Nifty 50 is back up to 8650 or thereabouts—rallying nearly 10% in two months. If you didn’t jump in to buy stocks at the near-term bottom levels, you may find prices too high once again. 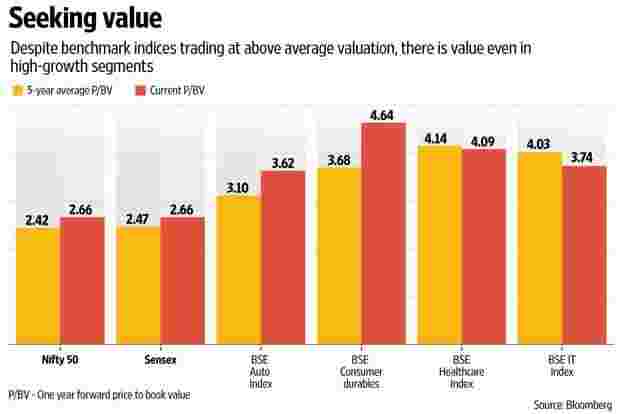 At a forward price earnings (P-E) multiple of around 19 times, the benchmark is trading at a value which is above the historical 16 times average. Mid- and small-cap stocks too have rallied. For those who didn’t buy, have you missed the bus completely or are there pockets of value in this market where you can find stocks at good price? It’s rare that the same segments rally each time the broader market rallies. The year 2016 saw some of the under-performing sectors move up sharply. This includes metal and commodity stocks, energy stocks, oil marketing stocks and utilities. Some sector indices around these stocks have rallied anywhere between 15% and 40% in 2016. On the other hand, technology and health care stocks lagged. These segments could well present the value opportunity that investors seek. According to Vikas Gupta, chief investment strategist, OmniScience Capital, “Technology companies have extremely strong balance sheets and there is earnings visibility. The concern is about near-term growth in earnings and where that could come from. As a result, stock prices have corrected sharply, presenting an opportunity to buy." According to Ajay Tyagi, senior fund manager, UTI Asset Management Co. Ltd, “In the health care segment, despite the uncertainties and hardships, majority of the companies are generating cash flows. Recent events are getting extrapolated to long term and people are not able to visualise the growth in this sector." You need to be careful though as it’s not always wise to apply a broad brush across an entire sector. Stock-specific investigations are important, specially in times of earnings uncertainty. Rajeev Thakkar, chief investment officer, PPFAS Asset Management Co. Pvt Ltd, said, “This is a time to be cautious and look for individual stocks with value. Finding clear value across an entire sector could be difficult." In case of technology, for example, while multiples are cheaper compared to the past, the environment is changing and the companies are very large sized—one has to look at what each company is doing to get incremental growth from here on, he added. The value approach to investing requires you to identify stocks that are trading at prices below their fair value. These could well be high-growth stocks. Fair value of a stock is what you are willing pay to own it based on the company’s future cash flows or earnings. Compare this to the market-price valuation and you can determine whether the stock is overvalued or undervalued. Tyagi said, “Companies with high return on capital employed, cash generation ability, low debt and ability to expand business will remain sought after despite fall in price and near-term uncertainties." In any market cycle, there will be some pockets of value. Gupta said, “Based on price-to-book value, the market is not expensive. Depressed earnings means that many companies with strong balance sheets are available at a good price. Gains can be extraordinary when the cycle turns."